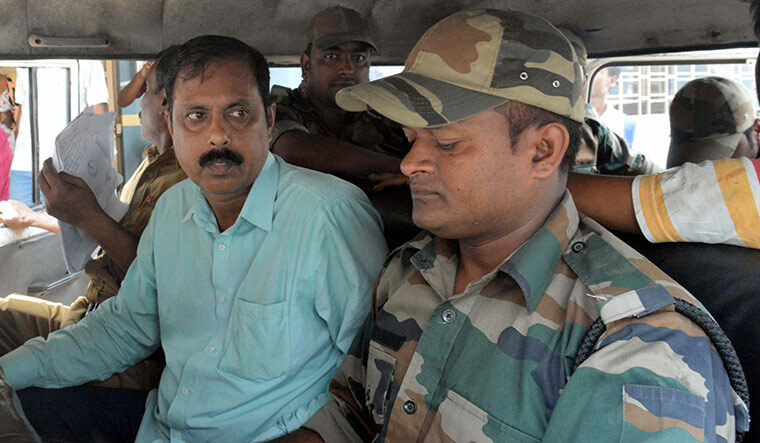 Caught in the act: Arabul Islam after his arrest on May 11. West Bengal Chief Minister Mamata Banerjee was left with no option, but to order the arrest of Arabul Islam on May 11, after the attempts to retake Bhangar from villagers backed by Maoists resulted in the death of a candidate contesting the panchayat elections. Bhangar, as THE WEEK reported in our last issue, has been a liberated zone since January 2017. The villagers retook the land, which was forcibly acquired by the state government in 2013 for a power project. The acquisition was carried out by a brigade of goons led by Arabul. The unrelenting crisis in Bhangar and the widespread violence during the panchayat elections have put the Mamata government in a spot. Arabul has been the point man for the ruling Trinamool Congress in Bhangar for more than a decade. In the 2006 assembly elections, which the left alliance won in a landslide, Arabul bucked the trend, and was elected from Bhangar as a Trinamool candidate. He rose quickly in the party. But, Arabul lost the elections in 2011, although Mamata won the state, riding the paribartan wave that lashed West Bengal. Arabul, however, did not lose his position in the party as he was close to two of Mamata’s confidants—senior leaders Partha Chatterjee and Sovon Chatterjee. The controversial power project was designated to be set up in Rajarhat in Kolkata’s New Town area, but Mamata wanted to develop Rajarhat as a high-tech satellite township. And, thanks to the Chatterjee duo’s faith in Arabul, the project was moved to Bhangar. None of the Trinamool leaders bothered to inform the chief minister that land in Bhangar was much more fertile than in Singur. “It produces high quality rice and the finest vegetables. It also has significant fisheries resources,” said Pradip Singh Thakur, state secretary of the CPI (ML) Red Star. But, the villagers could not resist Arabul’s brute power. Arabul has a sprawling house in Bhangar and a duplex flat in the New Town area. His son, Hakimul, and brother, Ajimul, are trained in using sophisticated firearms. They form Arabul’s security group. 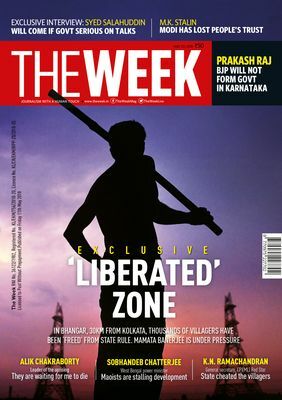 THE WEEK issue dated May 20 with the cover story on the ‘Liberated Zone’ in West Bengal. Arabul was expelled from the Trinamool Congress in 2014, after he assaulted senior Marxist leader Abdur Rezzak Mollah, who had been an MLA for more than 50 years. Mamata wanted to induct the veteran leader into Trinamool. But, after the government realised that a revolution was brewing in Bhangar over the power project, Arabul was reinstated quickly, and was entrusted with stopping the protests. But, the villagers stood firm, united by the ultra left ideology, making Arabul’s task impossible. In response, he set up a gang, armed them with sophisticated weapons, and targeted the villagers. Arabul’s gang surrounded the liberated zone. The moment people stepped out, they were attacked with acid, bombs and bullets. “So, we decided not to go out, and warned the state government to stop Arabul. But, Mamata did not pay any heed,” said Mosharaf. The situation worsened during the run up to the panchayat elections, held on May 14. Arabul chose May 11 to attack the liberated zone and target independent candidate, Hafijul, who was fighting the elections with the backing of the committee. Hakimul and Ajimul allegedly shot him dead. Five villagers also suffered bullet injuries. It was then the government decided to arrest Arabul. Despite the arrest, Trinamool has not yet taken any action against him. The villagers are plotting revenge. “We thought we would catch Arabul and punish him in our court. But, the chief minister saved him,” said Mosharaf. They now want Hakimul and Ajimul arrested. “Otherwise, we will catch them. The government must not disturb our territory,” said Mirzan Sheikh, secretary of the committee. The unrelenting crisis in Bhangar and the widespread violence during the panchayat elections have put the Mamata government in a spot. As many as 16 people lost their lives in the recent spate of violence. Prime Minister Narendra Modi sounded alarm over the situation and called it a murder of democracy. He asked everyone to come together to strengthen the spirit of democracy. State BJP president Dilip Ghosh met Governor K.N. Tripathy and requested him to send a proposal for the imposition of president’s rule in the state. “I told the governor that if this is not a case fit for article 356, then there would be no such case at all. The governor assured me that he would send a detailed report to Home Minister Rajnath Singh,” said Ghosh. The governor’s office did not, however, confirm the report. Ironically, the BJP, too, has been guilty of violence. Of the 16 people who were killed, four were from Trinamool and three from the BJP. The performance in the panchayat elections will be crucial for the BJP. In 2008, Mamata embarked on her journey to power by performing well in the panchayat elections. She subsequently captured the largest number of seats in the 2009 Lok Sabha elections, and then went on to win the assembly polls two years later. Whether the BJP will be able to match Mamata will be known on May 17, when the results of the panchayat elections will be out. It will also show whether the Bhangar crisis had any impact on the Mamata juggernaut.